Like many pipe makers, Peter Matzhold began his pipe-making, not as a career, but solely to make pipes for his own use. Born in 1952, Peter studied architecture in Graz, Austria, and upon finishing school, he worked professionally as an architect for several years. 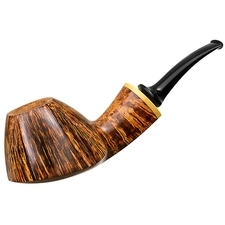 During this term, he began to make a few pipes for "fun and personal use", and perhaps because he did not think that people would take his pipes seriously. During a visit to Basel, Switzerland, Peter was convinced by a gallery owner (forced was the word Peter used to describe it) to display some of his pipes. This gallery showing dispelled any fears he might have had about the reception his work would receive. 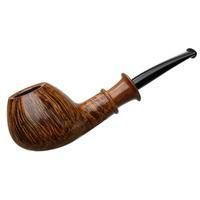 As a result Peter decided to abandon architecture and concentrate on pipe making. The most immediate benefit was a reduction in stress associated with his Architecture career. Peter likes to say that in architecture, he spent 10% of his time working, and 90% of it fighting, whereas in pipe-making, he spends 90% of his time working and 10% of his time on organization. 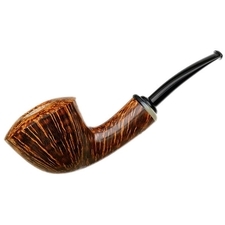 A long period of learning by trial and error followed this decision, as Peter's pipe-making skills were entirely self-taught. To make ends meet while refining his style and earning a reputation, Peter did pipe restoration and repair on the side. Gradually, these repairs became increasingly complex. Peter found himself all but remanufacturing existing pipes that had been destroyed in new and creative ways by their owners. His work was so good that his customers began to special order pipes to their specifications and German and Austrian collectors began to take notice of the young, talented pipe maker from Graz. Peter still lives near Graz, with his wife and two children. Peter's workshop is just feet from his home. Peter has everything he needs for pipe-making close enough at hand that he can dart into the workshop the moment inspiration strikes, regardless of the hour. It is safe to say that for Peter, pipe-making is not his job, or even his passion, it is his life. 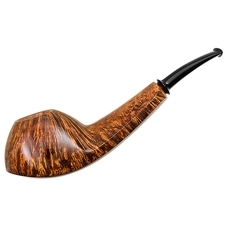 Peter holds fast to his defining principles of pipe design; he only produces pipes with what he considers to be perfect (straight or cross) grain, absolutely no fills, and clean, sparse lines, as his studies in Austrian Architecture taught him. Peter sums it up best himself: "So whenever you decide to buy a Matzhold pipe you can be sure to get a pipe with good grain made from the best Italian Briar with no fills, a handcut vulcanite mouthpiece, a smooth, waxed and polished finish, and a unique shape that is nice to touch, smoke, play with, and to look at." His pieces are often variations of freehand shapes and are each fitted with a stem and tenon turned from solid vulcanite rod. 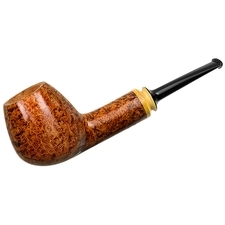 Not wanting too much flash on his creations, it would be very rare to find any material other than boxwood, olive wood, or silver, though most pipes are simply black vulcanite (occasionally cumberland) and smooth briar. 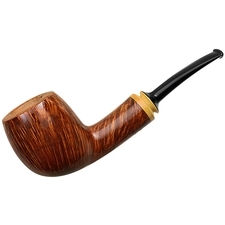 Producing around 200 pipes each year, the smooth finishes are all lightly stained, but the sandblasts can be either virgin, light brown, or black.